As you’ll know if you’ve been reading this blog recently, I’ve been thinking a lot about the latest tech trends courtesy of the Mary Meeker Internet Trends report. By far the largest section in the report (some 30 pages) is focused on how technology is changing the way we work. Enterprise software used to be about automation of pieces of the workflow. 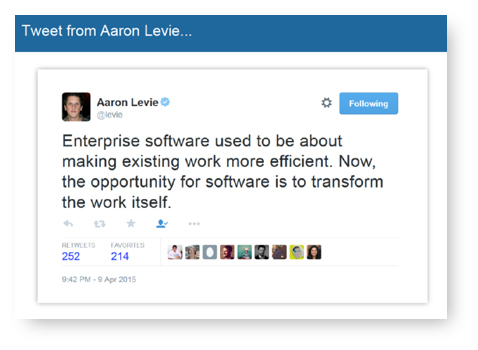 But it’s moved beyond this – enterprise software is no longer just supporting the work itself. The software is reshaping what it means to work (in some cases from the ground up). This shift has big implications for both developers and buyers of software. As a buyer you’re no longer purchasing something that just makes you more productive – you’re shaping the future of your organisation. At Cognology, how do we see the role of software shaping the future of work? Over 250 Australian businesses use Cognology’s performance management system to manage talent. It gives us a big opportunity (and responsibility) to think about how our software helps to shape the future of the Australian workforce. We want to give our users the flexibility to choose the best way to configure their performance management system. In fact, it’s our most significant design principle. So our approach is built heavily on delivering a system that has significant flexibility and configurability. But we also know that the defaults that we build into the system will have powerful long-term effects in our clients’ workplaces. We think carefully about these effects and try to make sure that they reflect the way we believe work is evolving. One clear example here is the role of in-application discussion and collaboration. I’ve got a strong view that organisations are healthier, happier and more successful when they promote open discussion and collaboration. Ultimately, everyone benefits when performance management is a discussion, rather than a decision per se. Our software reflects this, and wherever we have the choice, we’ll try to design to facilitate a discussion, rather than one of those one-way decisions. To give you an example of how this works in practice, employees using Cognology’s performance management system have the ability to crowdsource their own feedback before they enter the formal performance review process. This is similar to the way you might have seen a 360-review work – but instead of being pushed by the organization, the process is coordinated by the individual who is seeking additional feedback. We’ve seen this work very effectively in some of our large professional services clients. I know that our preference for collaboration doesn’t work for everyone (and users always have a choice to use or ignore our suggestions). However, it’s always powerful when we see these design choices start to nudge organisations towards a more collaborative approach to performance management. All vendors have a responsibility to create software that promotes healthy, happy workplaces. But it’s not just a vendor responsibility. Buyers also need to be asking how a product will shape their organisation – whether they’re doing so consciously or not. There is no one feature-set that will create ‘the perfect organisation’. Just like there’s no ‘one-size-fits-all’ organisational culture, there’s no ‘one-size-fits-all’ model for enterprise software. Do we want a collaborative workforce? … Does this set of product features make that more or less likely? Do we want a highly flexible workforce? … Does this set of product features make that more or less likely? Do we want your workforce to be able to work from home (or wherever else they are)? … Does this set of product features make that more or less likely? Do we want consensus driven decision-making? … Does this set of product features make that more or less likely? Do we want staff to move fast? To ask for forgiveness instead of permission? … Does this set of product features make that more or less likely? Do we want employees to work with each other? Or against each other? … Does this set of product features make that more or less likely? If the set of product features (and overall experience) doesn’t deliver the kind of workplace you want, then it’s probably time to look at new enterprise software. No business can escape the fact that software is changing the way we work. Because we all spend so much time with our enterprise software, it’s one of the most powerful change management tools available in shaping the future of the organisation. This means that as a buyer, you must be intentional in thinking about they way you want software to shape your workplace. The enterprise software that you choose now will shape the way your employees work and behave for the next 5-10 years. We think it’s worth pausing before you write the script (or the specifications) to really ask yourself those questions above, to make sure that your software takes your organisation to a place you want to go. Achieving your organisation’s goals and aspirations? Who doesn’t want the credit for that. Freelancing is the new workforce megatrend What is a feedback mechanism?